Gluten free, dairy free and refined sugar free. Grease and line a 22cm or 8" cake tin, I used a springform. Preheat oven to 150°C or 300°F fan forced. Place almonds in mixer bowl, mill for 10-20 sec/speed 8/MC on, until almonds are a fine ground. Set aside. Pour mixture in to prepared cake tin and place into the middle of your oven. Bake for around 20 min. Carefully feel the centre of the cake to ensure it is set. Grain free baking is dependent on individual ovens. You want the torte to only *just* set in the middle so that it is still moist. Let it sit for 5 min before serving warm or chill in the fridge for a fudge consistency. Place chocolate into mixer bowl, mill for 10 sec/speed 8/MC on. Scrape bowl down. Add coconut milk and cook for 3 min/50°C or 120°F/speed 3/MC off. You can substitute the coconut oil in the torte with macadamia oil if you prefer. The 70% dark chocolate is what makes this dairy free, if you are not concerned about dairy you can use your preferred dark chocolate. This is not a sweet torte, you can increase the sugar by 100-200 g | 3.5-7 oz as preferred. At step 1 if the almonds aren't ground finely enough at the end, blitz on speed 9 for a few extra seconds. At step 6 use speed 3. At step 12 add on extra melting time if not completely smooth after 3 minutes. Fill a saucepan one-third full of water and bring it to the boil, then reduce heat to a simmer. Put dark chocolate, coconut oil, coconut sugar, vanilla and salt into a medium sized heatproof bowl and place it over the water in the saucepan to melt slowly while stirring. Remove the chocolate from the stove and allow to cool for a few minutes then whisk in one egg at a time. When all eggs are whisked in, slowly whisk in almond meal mixture. Put dark chocolate and coconut milk into a medium sized heatproof bowl and place it over the water in the saucepan to melt slowly while stirring. This is not a sweet torte, you can increase the sugar by 100-200 g or 3.5-7 oz as preferred. I’ve got to say I was impressed with this recipe when eating it warm. But a warning to new players, it is NEXT LEVEL excellent when it’s left in the fridge overnight. HOLY SMOKES, so glad I took a chance on this recipe! We probably shouldn’t tell you this… but if you freeze in portions – it is delicious straight from the freezer as well! Trying this tomorrow night! For coconut milk, is the tinned Ayams stuff ok? 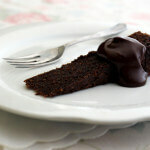 Jaffa health by chocolate torte!! For the cake I blitzed a small whole orange, peel and all, and added it between steps 5/6 and gave a quick mix. I also reduced the coconut oil by 25g and only used 4 eggs. For the icing I added the juice of half an orange. By all reports it was (even more) AMAZING! So delicious! I made this for a bake off at work and had to have a slice for breakfast as I had to go offsite for meetings all morning and didn’t want to miss out lol. The ganache was quite runny when I made it but after keeping it in the fridge overnight I had to give it a burst in the microwave. After sitting out with the torte it was the perfect consistency to dollop. Will definitely make this again. I think it would be great with some dollop cream to cut through the richness. wow! I’m not a Baker but so easy to make. Thanks Nik. Insanely good. Decadent and wickedly naughty. Wil lbe making this one again. Yup another winner. Turned out lovely the first time. WOW OMG….. what a decadent delicious masterpiece this is!!! It tastes its best I believe- when refrigerated for a few hours- just wow. If you have not made these already. You ahould! This is so easy and so delicious. I made it for a mothers group catch up and it was a hit. One mum even thought it was store bought! This has been requested by my in laws on several occasions, since they tried it the first time. It’s one of two of mdy go to recipes when I’m in charge of dessert. It’s to die for (see what I did there?? haha) and when it’s dressed up with beriies and figs and the ganache – Oh my goodness, heaven! I love this recipe! But best of all so does my gluten, sugar and preservative loving siblings! This is my go-to cake to make and it’s so great to have a beautiful chocolate cake that I don’t have to miss out on! 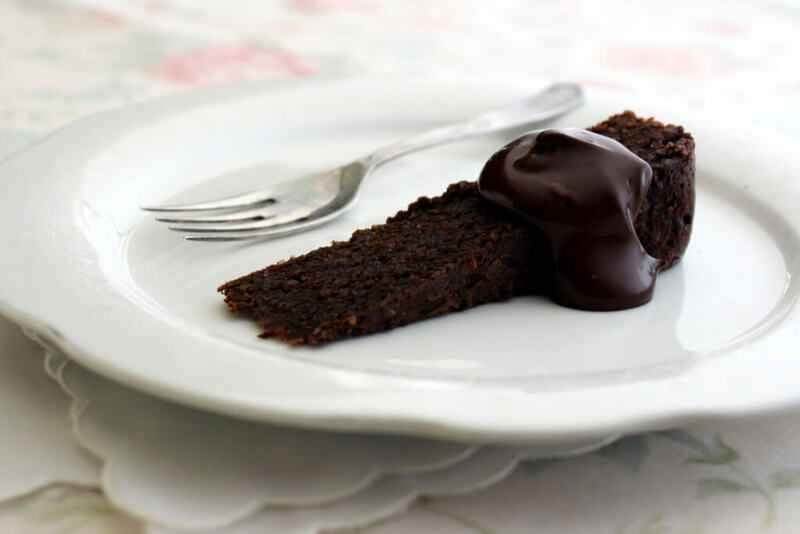 This chocolate cake recipe is absolutely amazing. I cannot believe how something can taste so Devine can actually be good for you. I love how many healthy Thermomix recipes Skinnymixers has. Made this delicious cake this afternoon and it was delicious! Had a mixture of nuts so used them all up and the flavor was lovely! Easy and delicious. My mum and sister said it was restaurant quality! Just delicious, even without the ganache, better than any chocolate cake!!!! So easy took 10mins and 20 mins to cook! Seriously one of my favourite desserts to make and always receive compliments on it! Quick, easy, impressive and oh so yummy. My oven is crappy and not fan forced so took over 40 mins and was still very gooy (perfect with ice cream). And now it has set in the fridge it is a perfect fudged/cakes/heavenly texture. This is VERY high praise from the 13yo male. Truly this is a delight. Thank you for an easy, and divine recipe. This torte is amazing and also very easy. Served with fresh blueberries and pure cream. Just awesome! Thanks Nik. Great chocolate fix and easy to ‘dress up’ for a dessert! Kyrie, have you frozen this with success and reheated with success ? OMG! Totally amazing. Love it. Will be making it again. It was so hard not to eat all the batter let alone wait for it to cook. I made this the other night and it was delicious. I only had some 85% chocolate and some 70% peppermint chocolate so I used the two to make up the required weight and it had a yummy hint of peppermint in it. Will definitely be making it again. Chia seeds mixed with water (can’t remember the ratio!) or applesauce are great egg substitutes. Sometimes a mashed banana works too – you’d have to have a play and wok out ratios though. Hope this helps you a bit! I made half the recipe today with 2 eggs. Put in mini cup cake papers and cooked for 8 mins. Perfect portion control. Love this recipe, well done. Thanks for another amazing recipe. This has become the go to chocolate cake recipe in my house. My newly 4 yr old even asked for it for his birthday cake. Thanks again! Again thank you. Made it for guest and everyone loved it right down to the kids. Hi Nikalene – I have made this twice now and just love it! Suits so many people of all ages. Thank you. Even with a dodgy oven and extremely low skill levels from the chef (me) this turned out incredibly. My son begged me for a chocolate cake for his birthday (he’s now 2 and doesn’t get chocolate anywhere NEAR as often as he’d like) so I made this. 5 kids and 18 adults raved about it. I served with whipped pure cream and the ganache (which started out like liquid but then “set”). Thanks Nikalene. Will you marry me? Thank you for this recipe. I made it last weekend for a family gathering and have been asked to bring it back as an encore for tonight lol. Hi, this dessert sounds great but I don’t have a Thermomix. Is it possible to get non-Thermomix instructions for this recipe. Thanks. Finally made this today… It was just as good as everyone says it is! I took it out too early (mainly because the kids were literally watching it cook through the oven glass) so was very gooey in the centre, but was still super delicious and there was no way the kids were gonna let me put it back in! Very easy and worth a try if you haven’t already. Words cannot describe how totally decadent and AMAZING this is…. you are truly an EVIL genius! This sounds delicious but I’m allergic to nuts, can I use regular flour? Is it possible to freeze this in portions with the ganache on? Made this for the second time yesterday. Easily fed eleven people. And everyone said how great it was. Gave the recipe out to non-Internetites so the legend can live on. Absolutely delicious! I used almond and hazelnut meal and 85% dark chocolate, served with raspberry coulis…..yummy! Thanks Nikalene!! Thanks Nik for a beautiful recipe. Made this a few times now, and its fool proof and def a winner. Once cooked the chocolate and almonds together. Another time just chucked the eggs in. Hi Michelle I have a meat thermometer how did you use it? Did you stick it into centre of the torte & once it was reached 65deg take it out of oven ? Because I think my torte is slightly underdone so I may need to use my thermometer in future…. My oven runs too hot so I had temp reduced by about 10 deg baked for 20 mins but it was a bit gooey. Didn’t want to dry it out so just took it out at that point. Would like to make it perfect next time. Delicious! Moist and rich! My kids devoured it! I used 100g Coconut Sugar and served with Double Thick Cream. Very easy to follow recipe too! So quick from start to finish! Thanks Nikalene! After all the raving about the Health by Chocolate torte, I made it when I knew we would have a few extra mouths to feed, and OMG… I think I died and went to dairy free chocolate cake heaven! I don’t usually let my kids eat that kind fo thing, but thought hey, its got coconut oil in it wink emoticon so I let them have a dig, and my 16mth old daughter filled her mouth with so much cake, that she had to spit it out it out to chew, and promptly started eating it again, a little gross, yes but she loved it! I didn’t have enough chocolate elft over for the ganache, but it was just delicious without! Its a major winner in this house and I will be making it again for sure! Delicious torte, rich and tasty. Did not do ganache as it was not going to be a celebration cake. After eating a small piece each fresh, i sliced into small portions, wrapped individually and froze in a container. Tonight we had a piece each again, still frozen, just as delicious. Thank you Nik forcreating this lovely recipe. You are wonderful. Cheers! I wonder if there is a way to do it egg free? Valentine’s day dessert and it is just fabulous, like a fudgy brownie. Coconut ganache was also yummy. Made the torte with 100g 70% dark chocolate and 100g dark chocolate melts as that was all I had. Just made and are this! It was delicious. Like others, I needed to mill the almonds longer. I split the mixture across two smaller springform tins so that we weren’t tempted to eat it all. Nikalene!!! Hubby and I have agreed you are definitely our kitchen valentine! I made this for work. Everyone loved it and came back for seconds and have asked me to make it again. Didn’t make the ganache but even by itself, the torte is delicious! This is fabulous, i used 100g of coconut sugar as I’m still learning to like dark chocolate and it’s perfect. My first ever go at grain free baking and I’m in love. Thanks again for another awesome recipe. Thank you for so many great recipes! Made this yesterday and left in fridge over night and cut up into little squares today – and omg Yum!!! Very simply to make as well. Love this recipe. I don’t make the ganache, just serve with full fat cream. Two days later it is still lovely and moist. I’m going to freeze in slices. My kids don’t like nuts, but do love the torte. Thanks nik. Omgosh – this was absolutely divine… Truly rich & decadent. Needed cream or icecream to cut thru the richness of the chocolate. 3 of 4 in my family looooved this. The 4th is not a dark chocolate fan. Just having a slice the day after with the torte being in the fridge for 24 hours and yummy! Even better then fresh. Absolutely divine. We had this tonight after the amazing Skinnymixers Massaman Curry. Feeling very full and blissful at the moment. Thanks for the fantastic food Nikalene. One clever woman. Easy to make and it is yum yum yum – my 3 year old son had 2 slices as soon as it come out of the oven and loved it ! Won’t last long in our house. Yet again another cracker recipe from Nik! Everything in my freezer right now is because of her. Thanks for all your hard work Nik! Anyone else feel we should be paying for these recipes! This cake is absolutely divine and super easy to make. I didn’t make the ganache and it was still absolutely amazing, will be my go to chocolate cake. Thanks Nikalene. No words Can sum up how awesome this is. Delish. Made it twice now with 50/50 dark and milk as well as the full dark and both are amazing. Served with a traditional ganach done with cream only because I was out of coconut milk but it is so so good. One to add to the favourites for sure. Made this for my daughters 21st. It was perfect, rich but not sickly sweet. Gorgeous texture and surprisingly light in that regard given we ate it cold when it’s ‘fudgey’. I made.this for.my husbands birthday. Made the night before and stored in the fridge so was a rich fudge like consistency. It was loved by all, even the restaurant staff demolished the left overs!!!! Most definately recommend this recipe! I made this for Australia Day, just to suit others I made it 50:50 with dark and milk chocolate. I also added hazelnuts and served with the choc sauce and a raspberry coulis. It was a massive hit! Thanks Nik once again for another fantastic recipe! Delicious .. rich chocolatey goodness! Yum yum yum thank you. Made it tonight yumm, too rich for the kids ho hum more for me lol. 3 Letters can sum this up……..O M G! Completely amazing …..had to cook mine for a lot longer for some reason, happens regularly with my oven but still soooooo good! OMG, so delicious nikalene, thank you again for another great recipe! We were all licking the butterfly and bowl! OMG I LOVE THIS CAKE!!! This is my PERFECT cake! I have always loved a similar tasting one at a local restaurant, but now I can make an even better one at home myself!! Will be making it again very soon. Thank you!! Made this yesterday using Lindt 85% dark chocolate then popped in fridge over night just ate a piece with dollop cream OMG my little slice of heaven thanks for the recipe Nik. Yummo!! made this tonight and it was delicious. Even my ‘I won’t eat anything remotely healthified’ husband went back for seconds! I made this for my mums birthday today and the cake was A SUPER HIT! I made this for a morning tea, and it was a huge hit!! I didn’t add the ganache and it was still rich and moist and lovely! This will be a regular for any occasion! So yummy! I didn’t use the ganache, ate it with cream while it was hot and it was like awesome. The rest was eaten over the course of 12 hours straight from the fridge. It went a bit like fudge when it cooled so it as like two treat in one! Even my husband (who is anti-healthy stuff )and my five year old (who is so fussy she eats plain rice for dinner) both went back for more. It was so easy it will become a regular in our house. I made this for a work morning tea & it was beautiful. I was a little sceptical as I’m not a coconut lover but it was hardly noticeable. I made it in a square tin & cut into smallish brownie sized pieces. It worked perfectly. I’ll be making again happily. The best cake I’ve eaten in my life. Don’t be fooled into eating it fresh, the next day it’s somehow 100 times better !!!! Don’t share it – be selfish ! Just beautiful. Very rich but we like it that way and it’ll last a while because you only need a sliver to feel like you’ve had a real treat. Love how it is grain free. Thanks for such a terrific recipe. So easy to make and yummy!!! I was skeptical about the coconut ganache but tried it with coconut cream and it is superb. The cake took about 22 mins in the oven to firm up in the centre. Will definitely make again. Thanks for a great recipe! This cake was a hit with everyone in my household, and has made me a star in my family’s eyes! I love that it is dairy-free, which means my youngest can also enjoy it, but seriously, even if you don’t have to be dairy-free or gluten-free, it will not disappoint. It was also ridiculously divine the following day after being refrigerated overnight, warmed up and served with a bit of vanilla ice cream (soy ice cream for the little one) Mmmm, mmmm….. It was so easy even my boyfriend could do it! Thanks I made this cake for my daughter’s birthday tonight. I used 90% chocolate and used about 75g xylitol instead of coconut sugar and a couple mini scoops of stevia as we were feeding sugar eaters as well and didn’t want it to be too bitter being 90% but we are LCHF. Also used almond meal already milled same weight, mixture seemed very dry/pasty however stuck with it, baked it for exactly 20 mins and removed. Served chilled with double cream and no ganache as I was lazy. It was delicious like a rich chocolate brownie! Everyone really liked it and I was asked for recipe. I like the orange idea by someone else.. Wouldn’t mind trying with some grated orange rind for a Jaffa taste. Will def make again. I made this and it was delicious. I used normal dark choc melts as that’s what we had and I couldn’t wait to try it. I think I needed to mill the almonds a bit longer and I cooked for 30 minutes and it still probably could have done with 5 more minutes. Will be making again for sure though. this is so delicious! I used dark chocolate orange Lindt (not dairy free). Took ages in the oven (60mins) but I used a 21cm cake tin, so maybe a bit thicker. Chocolate ganache was a bit runny, but thickenend the longer is was cooling, may have used too much coconut milk. Ooohhh… Flavored Lindt chocolate…. That would be delicious!! Jaffa torte! Did you forget to put the heat on? Leave MC off?